Hiring any company to come into your home to do work can be a scary thing. When you trust one of these companies, you know you will be getting quality tile cleaning services. Whether it is home or office, you can choose with confidence one of these companies for your Melbourne tile cleaning needs. GroutPro specialises in repairs, maintenance and enhancement of all tiled and natural stone surfaces with services. Unlike the other tile cleaning companies, Grout Pro can repair and replace damaged tiles as well as cleaning, recolouring, and sealing grout. Kitchen and bathroom makeover services can save you money on remodelling. Glass restoration services available too! Perco specialises in clean-up and restoration services. Fire or flood can damage your tile floors, and Perco can bring them back to life again. All work is guaranteed. 24 hour service available for water emergencies. Since 1997, Yellow Brick Road Carpet and Tile Care has been transforming dirty tile, grout, and cement into flooring and decking that looks like new again. Utilising low vapour cleansers, rotary scrubbers, and low and high pressure they get the job done. Superior Carpet care is known for bringing to your tile surfaces “the best clean you have ever seen”. Safely and gently cleaning man-made and natural tile inside and outside with attention give to the details. Hot water extraction process brings grubby tiles and grout to life. Tile and grout cleaning and sealing to prevent further staining are the cornerstone services of ASAP Steam Cleaning. Providing service 7 days a week utilising high pressure wash and truck mounted equipment to commercial and residential properties. Prompt and professional service is the goal of ASAP Steam Cleaning. Tile and grout cleaning and recolouring services available. Steamys uses only eco-friendly cleaning solutions. Truck mounted equipment means no mess from the cleaning process. Steamys provides a 100% Satisfaction Guarantee. Grout recolouring can bring a whole new look to your tile services. Let Steamys express your style in tile. Grout Pro tile and restoration specialists are experts in tile and stone surfaces. Not only do they want your tiles to be clean, they want them to be easy to keep clean. That means less muss and fuss for you the property owner. While some companies only clean tile and grout, Grout Pro can actually repair and replace broken tiles. Often times this saves considerable money from re-tiling an entire area. Grout Pro can service your residential and commercial tile cleaning needs in the Melbourne area with prompt and friendly service. Best of all, the work is guaranteed! Grout Pro has developed their own line of high quality cleaning solutions to help keep your tile and grout services clean. 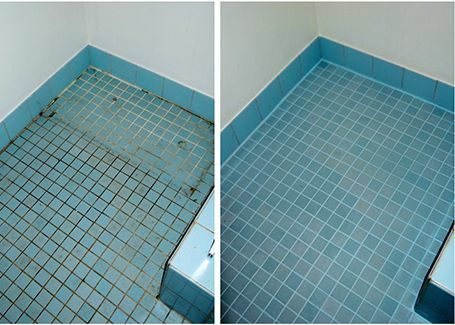 Prepare to be amazed at how easy it is to keep your tiles clean once Grout Pro has performed its magic. What should you look for when you hire a Melbourne tile cleaning company? Ask if the company is a member of the HIA, IIRC, or other professional organisations. These groups set the standards for proper cleaning methods as well as training and certifying technicians. A reputable company will give you a written estimate up front. The estimate should include all services that will be provided, such as moving any furniture. Like the cost estimate, ask for these in writing. Be aware that some stains are impossible to remove and these are likely not covered by the guarantee. If you have any questions, be sure to ask. A reputable company knows that the best form of advertising is a happy customer. They should be able to provide you a list of references of work recently performed. Also, don’t forget to ask friends, neighbours, and co-workers about their experiences. They may be able to refer you to companies where they had a positive experience. What should you expect from a tile cleaning company? On time performance. The technician should arrive when scheduled or call and let you know if there is a delay. Uniformed technicians and equipment. The technician should arrive at your home or office in a uniform bearing the name of the cleaning company. The vehicle carrying the equipment should also be clearly marked. Clear communication. The technician should be able to clearly let you know what to expect during the cleaning process and how long it will take and the costs. The technician should inspect the area before starting work. Once the work is complete, the technician should let you know and ask for your feedback. If something is not done to your satisfaction, this is the best time to address the situation, not after the technician leaves. You can try to clean tile and grout surfaces yourself, but only a trained professional has the tools, equipment, cleaning agents, and knowledge to do a first-rate job. Also, improper cleaning and sealing of tile and grout can actually harm the surfaces and cost more in the future to repair.